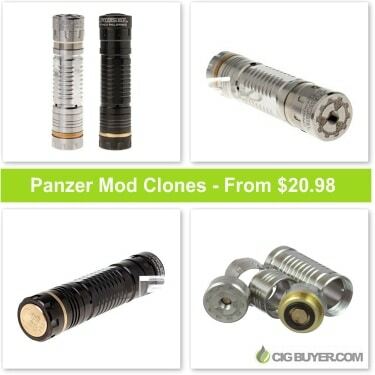 The Panzer Mod (by MCV) is an extremely popular mechanical mod that comes in various “cloned” versions – silver, black, gold and brass. For all intents and purposes, the clones are virtually identical to the original, other than a few minor differences in finish and construction. Visually, it’s tough to tell the difference and this is probably one of the most heavily cloned mech mods on the market.